Well, now that I’ve made you wait a couple of weeks to tell you why the Web is dead, I guess it’s time to disappoint (nothing can live up to that amount of hype). As my one piece of evidence I present this link. Go ahead, look at it. I’ll wait. So, what did you think? If you were thinking, “What the hell is Emacs?” you missed the point. I wanted you to look at the design of the page. In fact, you can check out this link to see the time and effort that went into that design. I’ll wait.. again. This is how that website looks on a mobile browser. 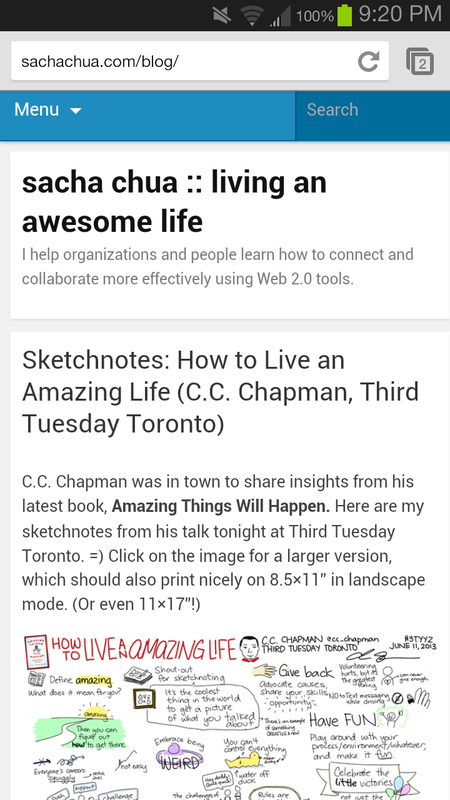 Specifically, that’s how it looks on Chrome for Android on my Galaxy S3. So that great design, gone. The artistry, gone. Everything that made that sight design unique and interesting, gone. “But Joey, the content is still there and surely that is what’s most important.” Yes, I know. Bear with me. It’s not just the mobile browsers, it’s the news aggregators that have been chipping away as well. Google Reader (now defunct), Feedly, whatever you want to use, they all strip the style of a site and just serve up the content. I’m old school and even though I’ve used Reader, even I have to admit that that it stripped away the context, the feel that the author intended to convey when they designed their site. Also, it makes it much easier to just go to your news aggregator and have things served up to you that you’ve previously subscribed to. Pretty soon, that’s all you’re looking at and the wider web is not within your walls. Speaking of walls, here comes the real web killer. The thing that is making the web the long lost child that everyone has forgotten. Apps. APPS!!!! Apps are creating walled gardens of content. Instagram instantly comes to mind as an example. It’s pretty much a mobile only experience (at first an iPhone only experience). Sure they’ve added some web content in the past few months, but it’s just an afterthought, the only real way to see and interact fully is through an app. Apps are putting up walls where the web had previously broke them down. Before the web, AOL, Prodigy, CompuServe, etc. all served up their own private content, and if you didn’t subscribe, you didn’t even have access to it. Apps are doing the same thing. To view and create content through certain services, you have to have their app. And some apps are iPhone only, or Android only, or only available on certain phone carriers. This isn’t progression, it’s regression. We are literally traveling back in time to the land of AOL and the private BBS. Hello, Joey! =) I’m glad you like my site. I really should get around to making a properly responsive theme for it instead of relying on a mobile WordPress plugin to handle small screens. As for RSS aggregators, I suspect the content focus might be a feature, not a limitation. ;) Many of the blogs I enjoy reading include follow-up links in their blog posts, so I end up clicking through and exploring those in the context of the original site. Also, if I want to check out the comments, I view the blog post on the original site.